Vitamin B-12 is essential to your health. Your body uses vitamin B-12 to make red blood cells, DNA and nerves, among other functions. Even though vitamin B-12 is critical to your well-being, your body can’t produce it on its own. Instead, people have to rely on foods and/or supplements to get vitamin B-12. Because of the amounts needed to maintain a healthy lifestyle, many people experience vitamin b-12 deficiency. The amount of vitamin B-12 you need every day depends on various factors, such as your age, your eating habits, your body’s ability to absorb the vitamin, any medical conditions you may have and the medication you’re currently taking. In general, the amount of vitamin B-12 you should get daily will increase as you get older. Infants up to six months of age need0.4 microgramsof vitamin B-12 every day. Children between the ages of four and eight-years-old should get 1.2 mcg of the vitamin every day while a typical adult needs 2.4 mcg daily. Adults who are breastfeeding should intake 2.8 mcg of vitamin B-12 per day. There are basically two kinds of food that contain vitamin B-12, animal foods and fortified foods. Dairy products, eggs, fish, meat and poultry are animal foods that have vitamin B-12. To see if a food has been fortified with vitamin B-12, you’ll need to check the item’s nutrition facts label which is located on the food’s packaging. How Widespread Is Vitamin B-12 Deficiency? Luckily, the symptoms of vitamin B-12 deficiency will usually go away when your body is getting enough vitamin B-12 regularly. Unfortunately, if you’ve suffered nerve damage due to this deficiency, the damage may be permanent. 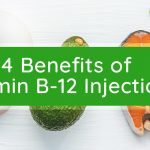 If you have a severe vitamin B-12 deficiency, your doctor may treat you with weekly vitamin B-12 shots or high-dose vitamin B-12 pills that you’ll need to take daily. If you have a mild deficiency, it can usually be corrected with a standard multivitamin. Vitamin B-12 can help your liver and gallbladder process fats so that they’re burned off before they can settle on your body. This can help you lose weight and prevent you from gaining back any weight you’ve already lost. Dr. Weight Loss of Atlanta providesvitamin B-12 injectionsthat will optimize the function of both your liver and gallbladder and facilitate weight loss. To learn more, contact Dr. Weight Loss of Atlanta today.